This weekend brings us officially into December and brings along a bit of cold across the entire region (the first snow fell this week!) and several Christmas events. Let’s take a look at some of the most interesting. This is the last weekend for Chianti d’Autunno, dedicated to local products and cuisine across all of the major towns in Chianti, both in the provinces of Florence as well as in Siena. Anyone who loves good food should go check it out! If you would love to head out to a food related festival, such as a sagra, then check out this article on the flavors of fall in Tuscany which indicates those available in November. This weekend is the monthly appointment with MIBAC’s “Night at the Museum“. For the occasion, the Uffizi Gallery, the Accademia Gallery and the Medici Chapels will be open at night. You can find more details in our past post here. From Saturday, November 30 to December 8, the Fortezza da Basso in Florence hosts the Florence Biennale, the International Biennale of Comtemporary Art. For complete details, read our post here. Florence has also hosted the German Christmas Market for several years and with it arrives the atmosphere of the holiday season. Head to Piazza Santa Croce for the Christmas market, which already started two days ago and will continue until December 23rd. For another Christmas market, head to Palazzuolo sul Senio, in the upper Mugello, this Sunday, December 1 (and every Sunday up until Christmas) where you will find Magie dell’Avvento, magic of Advent. The market will also include lots of food, local products and activities for the family. San Gimignano also hosts the event “Chestnuts and New Wine in San Gimignano” this weekend on December 1st. To learn more, read our post here. On Saturday, November 30th and Sunday, December 1, the magnificent Piazza del Campo in Siena hosts its all-day, annual market called “Mercato del Campo“. With over 100 stands offering local handmade and artisan products, including food, the market will take over the city as the occasion will also mark the lighting of Christmas lights and decorations all over. If you’re interested in visiting Siena this weekend or in the next few days, we recommend you read this post as it includes details on upcoming events in Siena. 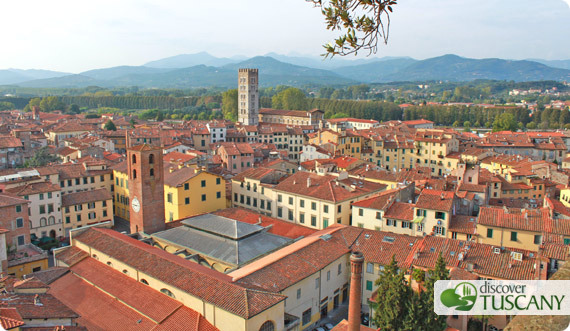 This weekend, Il Desco: Sapori e Saperi Lucchesi brings tastings, seminars, labs for adults and kids to the Real Collegio in Piazza del Collegio in Lucca. Connected to the event, there will be many offerings in restaurants and shops in Lucca as local products are promoted. In Marina di Pietrasanta (in the province of Lucca), head to La Villa and park La Versiliana on Saturday and Sunday from 9:30am to 7:30pm for the “Pietrasantaklaus” Christmas event! You’ll find a Christmas market with many artisans from all over Italy offering their wares. Hope you have a fun and tasty weekend! Born in Florence at the end of the fabulous '70s, Cristina has always lived in the famous "cradle of the Renaissance". She's in love with her homeland, but also enjoys traveling and discovering new places. Cristina is mum to a lovely little girl, to whom she hopes to pass on all the passion and love of our precious, wonderful Tuscany.